Wasabi is a very popular condiment in Japanese cooking, finding a home in sushi, grilled meats, and even desserts like wasabi ice cream. It is a bright green, moderately spicy species of horseradish, a type of plant that grows with a thick root (rhizome) and long stems. The root is commonly grated to produce a fine purée that brings out it's flavor. 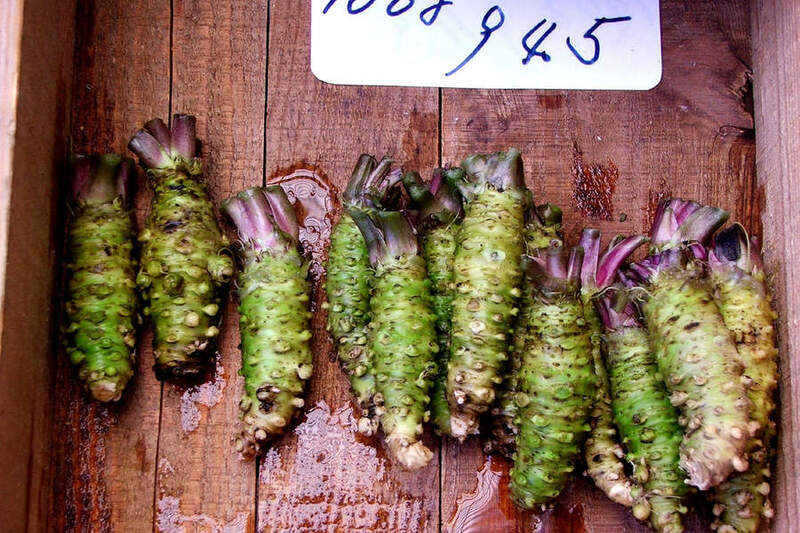 Wasabi has a very unique flavor and spiciness similar to European horseradish, but more of an herbal taste. 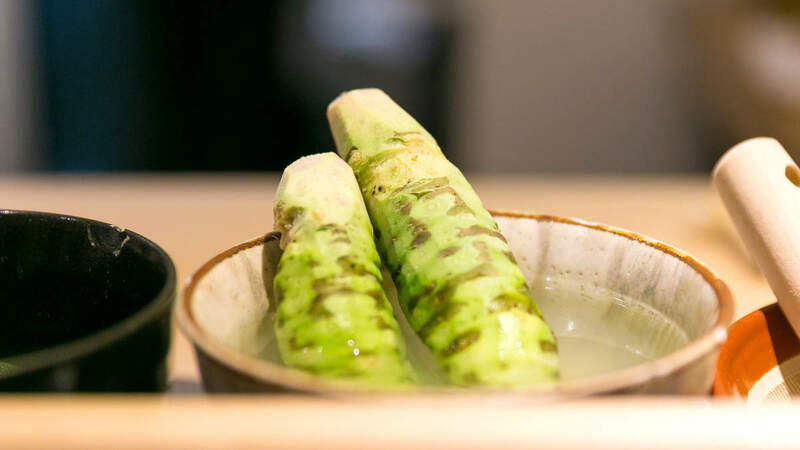 It is worth distinguishing between fresh wasabi (of the ground wasabi root) and imitation wasabi, which is actually made from European horseradish and mustard with green dye. 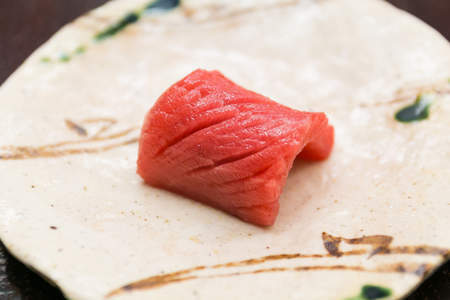 The vast majority of wasabi eaten in Western sushi restaurants is not fresh wasabi from the grated root, but rather this rehydrated powdered wasabi imitation. The differences are noticeable with fresh wasabi having a distinctly clean and herbal taste whereas imitation wasabi tastes a bit more stale. Imitation wasabi's inexpensive price tag makes it much more popular than wasabi root, which tends to be much more expensive. Most people familiar with wasabi have eaten it with sushi. 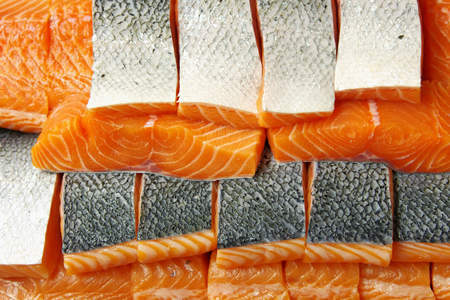 In traditional sushi, the chef takes a small dab of wasabi and places it on the fish between the rice. This allows the flavor to come as a refreshing after-taste that helps balance the taste of the neta (fish) and shari (sushi rice). 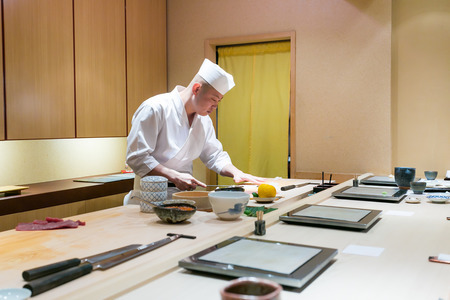 However, sometimes chefs want to emphasize the wasabi taste and therefore place it on top of the sushi. 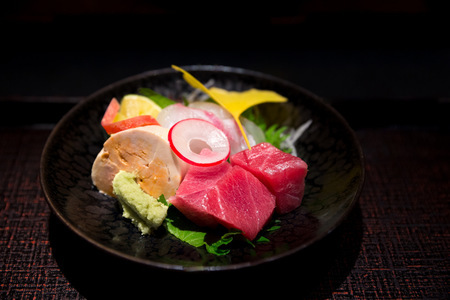 Wasabi may also be placed on the side of the plate, which is for the customer to add more if desired. Wasabi is not restricted only to sushi though. It can accompany dipping noodles like soba and is even popular with grilled steak. The leaves are also edible and often find a place in salads and Japanese pickles called tsukemono. Because of the spicy taste, you should generally eat wasabi in moderation. It is not spicy like a hot pepper where the spice lingers; it has an instant wave of heat that quickly dissipates, but too much at once can be unpleasant. 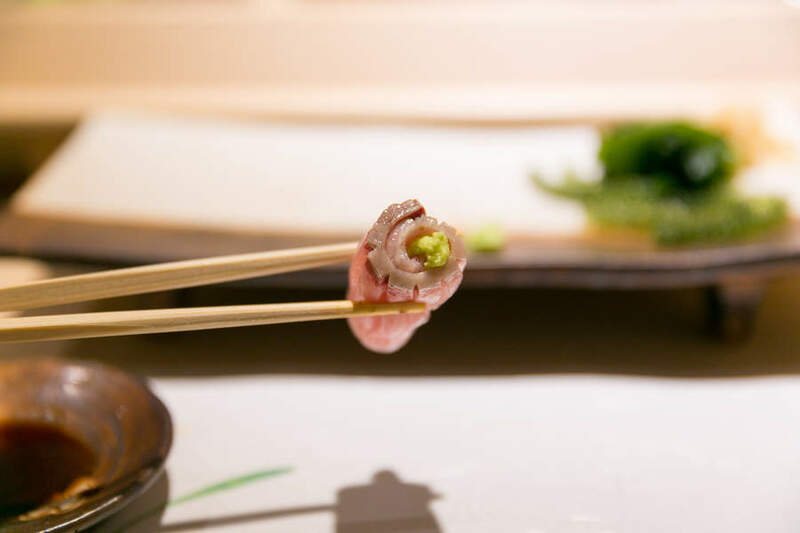 For most foods, the proper way to eat wasabi is to pick up a small dab with the chopsticks, place it on the food, and eat the bite. 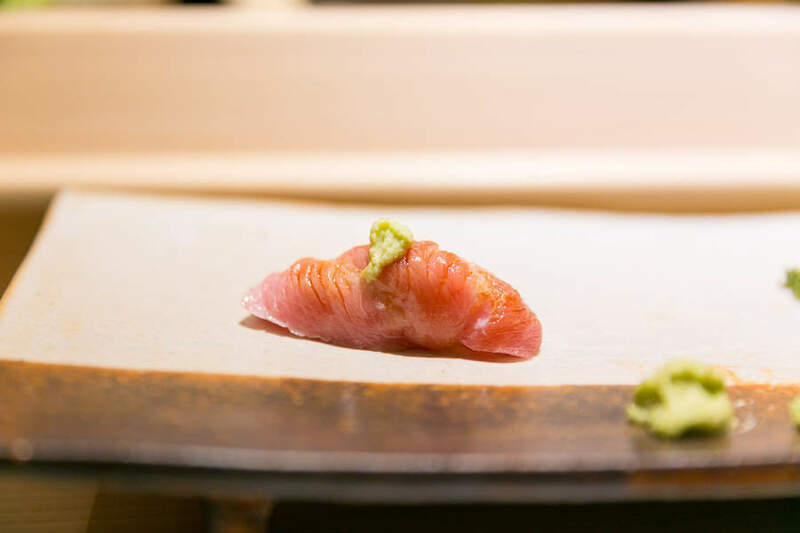 In nigirizushi, the wasabi is incorporated into the piece between the fish and the rice so there is no need to add more unless you want more wasabi taste. 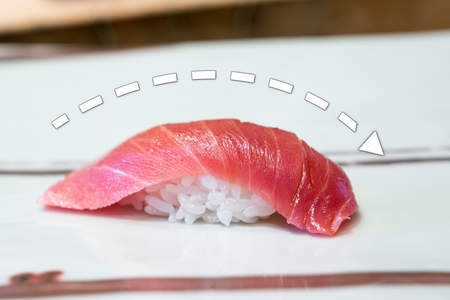 When eating sashimi, the preferred way to eat the wasabi is to place a bit on the fish, fold or roll it, then dip in the soy sauce and enjoy. Mixing wasabi into the soy sauce is improper in Japanese eqiquette and dilutes the flavor and heat of the wasabi. The wasabi root (of species Wasabia japonica) is actually the rhizome that grows just slightly above the ground. 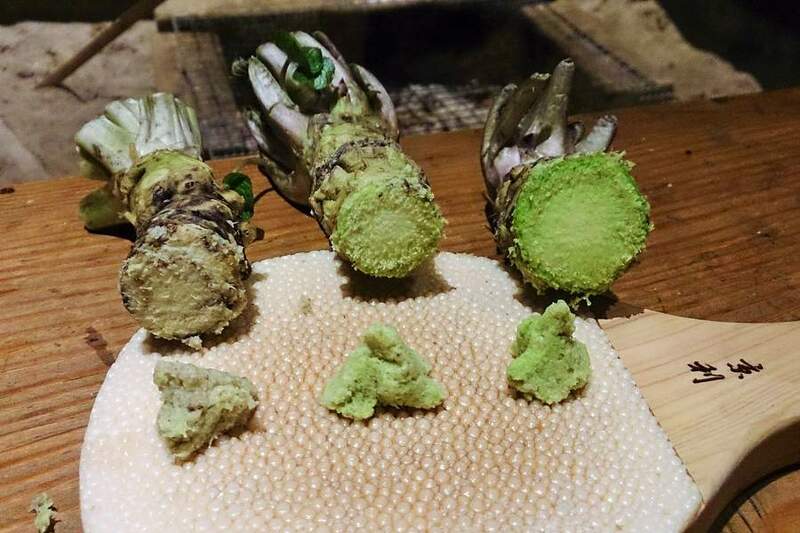 The rhizome of an adult wasabi plant, once trimmed of any buds, weighs about 2 ounces (60 grams) and measures about 5-8 inches (12-20 centimeters). The root itself must be grated on a special grater called an oroshigane. Once grated, the wasabi begins to lose its flavor over time and is best to use it soon. You can buy a metal oroshigane or one made from rough shark skin called a chojiro. Of course, these can also be used for other roots like ginger and daikon. Two very common varieties of Wasabia japonica are Daruma and Mazuma. Daruma is the most popular cultivar. Though it tends to be milder, it has a more attractive appearance. Mazuma is a bit hotter. Aside from japonica there is also Wasabia koreana and Wasabia tetsuigi, both of which are different species but have a spicy rhizome as well. Wasabi of different species and regions are picture above. You can see the dramatic difference in color, even though all are three-year old rhizomes. Unfortunately, many people do not realize that most wasabi they eat is fake. The high cost and limited availability of real wasabi makes the powdered kind a more reasonable option. 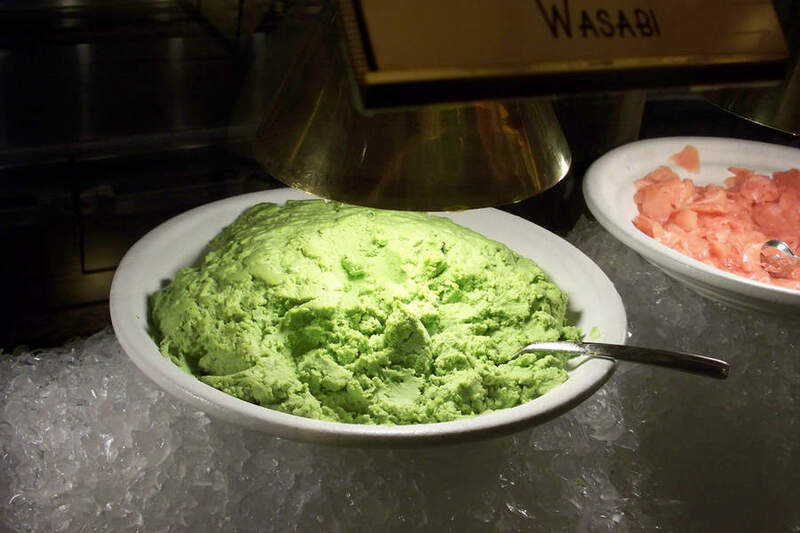 Imitation wasabi comes in the form of a light green powder, to which you add a small quantity of water to rehydrate. This will form a paste that closely resembles freshly-grated wasabi paste. High-quality imitation wasabi can be a very good substitute if the real plant is not available. The taste is very similar, but the subtleties like how the heat feels and fresh herbal taste are lost. Of course, the quality of imitation wasabi widely varies and can be very poor, having almost no heat at all. The fresh wasabi root can sometimes be purchased in gourmet Asian supermarkets, though this is very rare and only available during certain times of the year. In the USA, there are a small number of wasabi farms who mostly cater to the wholesale market. Oregon Coast Wasabi is one of the few commercial wasabi farms who sell to consumers. Expect to pay about $50 - $75 for a single rhizome, which can produce enough wasabi to accompany about two weeks' worth of meals. It is possible for the home gardener to grow wasabi plants, but it has a reputation as being the hardest plant in the world to cultivate. In nature, wasabi grows in riverbeds under the shade of the surrounding trees and expects a constant flow of water through loose sulphuric soil. The world's largest wasabi farm is the Daiō Wasabi Farm, whose large-scale production is made possible only thanks to its location on numerous streams that provide clear, pristine water from the Northern Alps. It is possible to achieve similar ideal conditions for wasabi plants, but they will take quite a bit of care and can only be harvested after 1.5 - 2 years. The best chance of successfully growing wasabi is to buy plant starts—wasabi is almost never grown from seed. The soil must be kept very wet but very well-drained to emulate the streambeds in which they are native. They must also live in full shade and never be exposed to temperatures above 80°F or below 32°F. After about 2 years, you can pull up the plant, harvest the rhizome and leaves, and pluck off the off-shoots. These can be used as more plant starts to begin growing more wasabi right away.